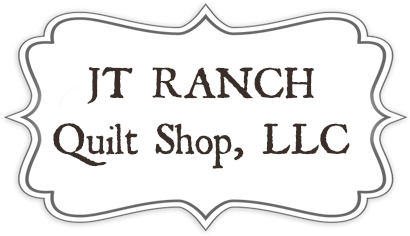 LT Ranch Quilt Shop, LLC originally opened its doors on the Choate Ranch as JT Ranch Dry Goods. Our company name reflects the registered cattle brand, JT, established in 1948. Today our store is located at 706 Conrad Hilton, in Cisco TX. In addition to over 1000 bolts of fabric, our spacious building features a gift shop and florist, a fully equipped studio for embroidery and longarm quilting, plus a classroom, and a demonstration area. As we grow, we look forward to the opportunity of offering our customers a 4000 sq. ft. retreat center and bed and breakfast. In addition to western themed fabrics, our specialties include longarm quilting, monogramming, and screen printing, as well as sewing education classes in a range of topics, including beginning sewing and quilting classes, traditional quilting classes, block of the month programs, along with designated classes, clubs, and camps for kids. Our focus is on providing our customers with the best in product quality and personalized service. We're a friendly bunch of folks with a passion for helping our customers with questions and projects, big or small. We continually strive to do all we can to increase the quilting capacity and enjoyment of each person who walks through our doors!